HA NOI (VNS) — Hoang Xuan Vinh of Viet Nam set a new world record in the men's 10m air pistol event at the International Sport Shooting Federation World Cup Rifle and Pistol World Cup. The tournament was held at Fort Benning in the United States. This is the second time that a Vietnamese shooter has set a world's record. The first belonged to Tran Oanh 52 years ago during the men's centre-fire pistol event in then Czechoslovakia. 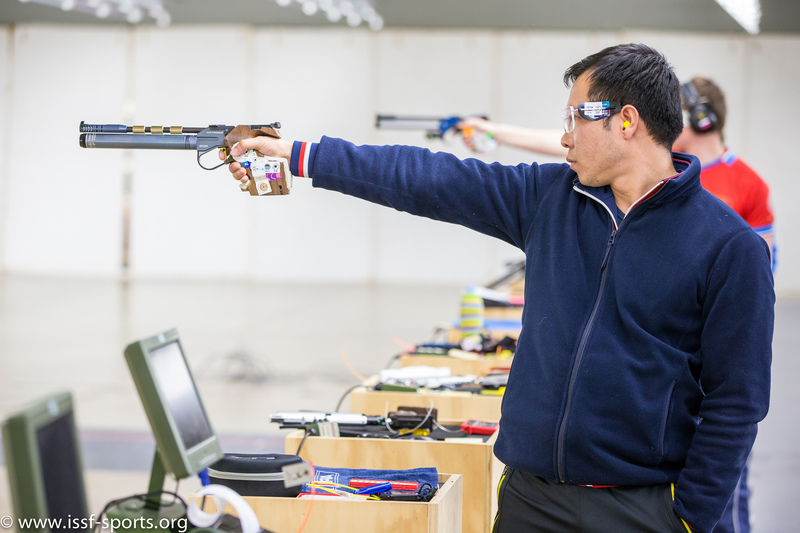 Olympian Vinh won his gold medal in the shooting event with a score of 202.8 points in the final round. His new high score was 0.5 point better than the former record set by Chinese Olympic champion Pang Wei at the Asian Championship early this month. This is also Viet Nam's new national record. Vinh's victory was not expected, after his eighth place finish during the qualifications. His 282 points qualified him last to enter the finals, while his teammate Tran Quoc Cuong stood at third, with 284. However, in the finals, Vinh was in a relaxed mood since results from the qualification would not be counted. The Vietnamese competed better, with an improved position after each round. Vinh, 39, jumped to the top after the seventh round of shooting and successfully protected his position against Russian challenger Sergey Chervyakovskiy. Further, 14-time World Cup champion Chervyakovskiy, 28, and fellow countryman Vladimir Gontcharov, 36, finished in second and third place with 202.3 and 181.3 points, respectively. Gontcharov, a 14-time ISSF World Cup medallist who began competing back in 1990, had not competed in the ISSF since 2012, when he had won his last medal – a bronze – at the Rifle and Pistol World Cup Stage in Milan, Italy. Wei, coming from a victory at the Asian Championship in Kuwait just 20 days ago, ended in fifth place with 138.6 points, behind Japanese first – time finalist Horimizu Kojiro. who came in fourth with 158.8 points. Horimizu's teammate, Matsuda Tomoyuki, the 2010 World Champion, ended in sixth place with 117.8 points. Vinh's teammate Cuong stood at seventh, with 96.5 points. This is the second World Cup gold medal for Vinh, who first triumphed in South Korea last April.